Keep out unwanted intruders with Fengate Manufacturing Ltd’s range of high security fencing. 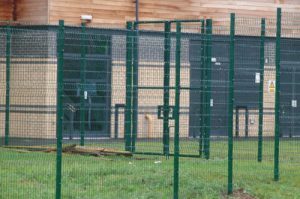 ‘Prison mesh’ as it is commonly known is a mesh high security fencing system with narrow apertures. This prevents the ‘would be intruder’ having any foot or finger holds therefore making it extremely difficult to climb. The panels are overlapped at each post and secured by a full length clamp strip, domed headed bolts and permacone security fixings. The introduction of colour has now made the 358 prison mesh system a popular choice when security is paramount.